Everyone involved in research with human subjects knows about the importance of informed consent. The purpose of informed consent is to promote educated decision-making and voluntary participation in research. Whether or not you’re aware of the fundamental ethical principles underlying the process (patient autonomy and protection from harm, for those keeping score at home), you at least know that you have to get the study participant to sign the form. Contrary to common usage, informed consent is actually not a form but rather a process. The document that the participant signs – ideally after a thorough discussion with a researcher about the goals, methods, risks, and benefits associated with the study, but more realistically after being handed a 10 page document and then being asked to sign it – serves merely as legal documentation that the process of informed consent has taken place. But in modern day parlance, informed consent has been reduced to the form. Regulation has led to lengthy, complicated consent forms. Research with human participants has rightly been strongly regulated since the Second World War. The Declaration of Helsinki stipulates that all research involving people must be formally approved and overseen by an ethics committee. Similar regulations and guidelines (such as the International Ethical Guidelines for Biomedical Research Involving Human Subjects from the CIOMS/WHO, and the U.S. Code of Federal Regulations: Protection of Human Subjects) further require that the information provided to study participants must be written in simple language that is appropriate for the individual’s level of understanding. These prerequisites, for better or worse, have led to the development of institution-specific templates for patient consent documents, both for research and clinical purposes. Information sheets and consent forms aren’t getting any shorter. It has been established that informed consent documents are getting longer and longer. Research in this field has mostly focused on clinical trials, where documents on average exceed 10 pages. Data from an educational context suggests that people are unlikely to read documents that are longer than 1000 words, or roughly four pages, which is bad news in a time when consent forms are pushing the 10 page mark. They’re also not getting any easier to understand. Paasche-Orlow and colleagues published a study in the New England Journal of Medicine in 2003 that examined the readability standards as well as the actual readability of sample texts provided by IRBs at 114 major American medical schools. Most IRBs required that consent documents be written at an 8th grade reading level. However, the mean actual readability level of the provided templates (as assessed by the Flesch-Kincaid scale), was 10.6, indicating a discrepancy of more than 2 grade levels. It was found that only 8% of the surveyed medical schools provided template consent documents that met their own readability standards. Given that 50% of all Americans read at or below an 8th grade reading level, this finding is troubling. 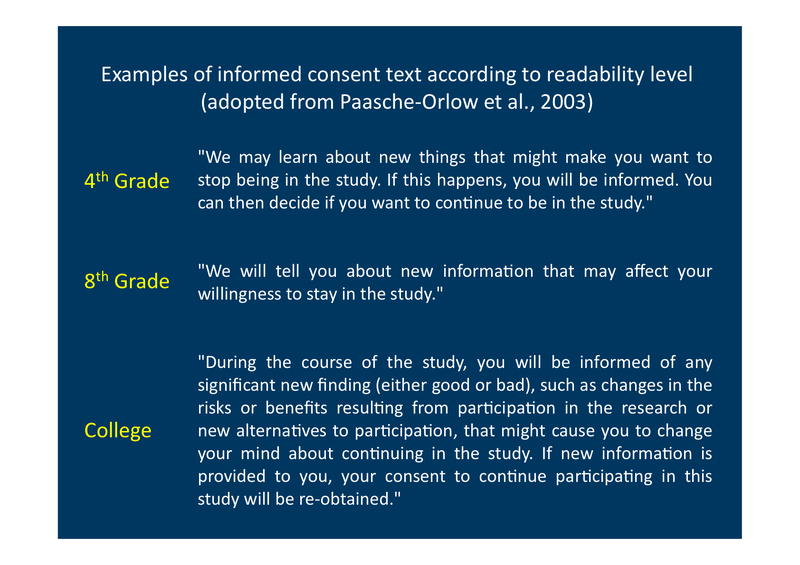 Examples for informed consent texts at different level of readability. The same content is shown on 4th grade, 8th grade and college level relating to a putative passage in a consent form dealing with new risks during a study. This example is taken from Paasche-Orlow et al., 2003 (NEJM). But would simplifying the language lead to better comprehension? It seems that it doesn’t. A French study from 2010 indicated that improvements in consent form readability by reducing language complexity did not lead to higher comprehension. In short, participants who received the easy form were just as poorly informed as those who received the more complicated form. But this is assuming that the participants even read the documents to begin with. Do people even read these things anyway? The answer seems to be no. Desch and colleagues examined how closely participants in a so-called “low risk” genetic study read consent documents. The investigators established an online consent form for healthy siblings of affected individuals already enrolled in a study investigating genetic risk factors for thrombosis and hemostasis. The online nature of the consent form allowed researchers to monitor how long participants spent reading the information before clicking “agree”. The researchers furthermore embedded a hyperlink in the document that said, “If you are reading this form, please click on this sentence.” The consent document was based on the template provided by the IRB at the University of Michigan and was approximately 2800 words long. Based on average reading speeds, it was estimated that 566 seconds (almost 10 minutes) would be required to read the document thoroughly. A total of 1209 individuals (94%) agreed to participate in the study. The median time to consent was just 53 seconds. Even more troubling was the amount of time taken by parents providing consent on behalf of their children – a median consent time of 13 seconds. The final nail in the coffin is the fact that only 2.5% of participants identified the hyperlink, which is arguably a good marker of how many people actually read the information. Unsurprisingly, these participants spent a significantly longer time with the document than those who missed the link (621 seconds vs. 54 seconds). What’s the take away message here? Bluntly put, it appears that nobody is reading consent forms. Whether these results can be extrapolated to other studies is arguable, but it isn’t hard to imagine that most participants don’t fully read the information provided to them, especially when these documents are lengthy and written in complicated language. What is a researcher to do? The answers are unfortunately murky and not straightforward. Desch and colleagues have called for a major reform of the regulatory process, including possible exemption from ethics review for some “low risk” studies. The argument is that lengthy and confusing consent documents discourage individuals from taking part in medical research. This argument certainly has its merits, especially in terms of the benefits for society as a whole, but it seems to miss the point of informed consent. Unlike those license agreements that appear whenever we upgrade to the newest version of iTunes, consent forms are meant to educate and inform participants, not legally protect the researcher. While elimination of consent procedures for minimal-risk studies would no doubt boost study participation – and, let’s face it, save researchers countless hours of bureaucratic hassle – this solution seems less than satisfactory. This suggestion is especially untenable for research involving children and other so-called vulnerable populations, which includes many patients with rare epilepsies recruited for EuroEPINOMICS. Another potential solution would be replacing or supplementing reading with conversation. One study suggests that reading comprehension is higher when consent is obtained in a face-to-face context. However, this approach would be logistically more complicated and would undoubtedly require more time from physicians and researchers, who are already stretched to capacity. Multimedia aids such as videos may be an appropriate compromise. While the long term solutions to the problem of informed consent remain elusive, one thing is clear: don’t make your consent forms any longer than they are now! Odds are your patients aren’t reading them anyway. Katherine Helbig is a certified genetic counselor and ethics coordinator for the popgen 2.0 Biobank Network (P2N) at the University Hospital Schleswig-Holstein in Kiel, Germany. Katie Helbig is a licensed genetic counselor with the Division of Neurology at the Children’s Hospital of Philadelphia, where she researches the role of genetic factors in childhood onset epilepsies and related neurodevelopmental disorders and provides genetic counseling to families in the Neurogenetics Clinic. She has a longstanding interest in epilepsy genetics, with previous experience in research, bioethics, and genomic diagnostics. She is co-chair of EpiGC, a member of the ClinGen Epilepsy Gene Curation Expert Panel, and member of the ILAE Task Force on Clinical Genetic Testing in the Epilepsies. This entry was posted in 2012, Bioethics, EuroEPINOMICS, Papers and tagged biobank, bioethics, consent form, P2N, popgen, readability. Bookmark the permalink.